Welcome to the official website of the Irish traditional fiddle player, Jesse Smith and accordion player, Colm Gannon. 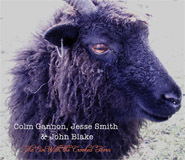 In this website you will find information on: biographical details, information on Colm's father John Gannon in said dedicated section, Photos, Audio samples of Jesse and Colm's music, Videos of Jesse and Colm, Reviews on Jesse and Colm, Links relevant to Jesse and Colm, Recordings that Jesse and Colm has made including their new album "The Ewe With the Crooked Horn", featuring guest artist John Blake on Piano, Guitar and Bouzouki, and details of how to get in Contact with Jesse and Colm for booking enquiries. For all North American bookings please contact our North American agent Ruby Hoy at http://www.rubyhoy.com for all other bookings contact Colm and Jesse at SmithandGannon@gmail.com. Use the buttons above to navigate through the site to access an area on which you would like to gain information on Jesse and Colm. Enjoy your browse!